Q. What is your favorite Motion Pro product (Name/Part#)? A. My favorite Motion Pro product is our 8mm Mini Bleeder P/N 08-0482. Q. What makes this one of your favorite products? A. I love this little tool because it has everything I need to makes a job I used to dread easy, and clean. 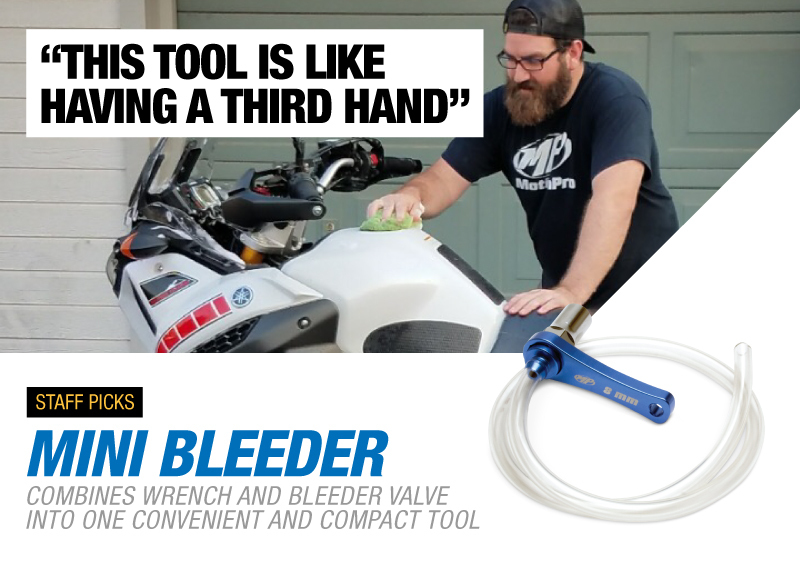 This tool can be used to flush the brake system at the caliper, or just to bleed a small amount of air from the system at the lever to improve the feel at the lever. I also like that it has an internal seal on it so, once I’ve put it onto the bleed screw, it stays put and seals completely to prevent any fluid from leaking out and getting on my tank or on my caliper. There’s also a one way check valve to keep things moving in the right direction so it makes bleeding/flushing super easy. This tool is like having a third hand. My favorite thing however is that when it’s time to service my brakes, when I look in my tool box everything I need aside from a catch can is there in one small package. There’s some tubing, and a small floating wrench which stays on the tool so I don’t have to worry about dropping or losing it. The wrench is micro adjustable, and the handle is short so it makes it easy to get into small spaces and limits my leverage so I’m unlikely to over torque the bleeds crews by accident. Q. How often do you use this product or is it installed on your Motorcycle/Scooter/ATV/UTV/Snowmobile/Vehicle? A. Being that most Japanese bikes use 8mm Bleed screws, this tool fits all my Yamaha’s. My XTZ 1200 has a hydraulic clutch, I look forward to bleeding my hydraulic clutch with this tool as well.